Bajdah, located around 100 KM northwest of Tabuk. It is characterized by its beautiful hills and it's multicolor sand banks. Thousands of rocky formations spreading over hundreds of kilometers, each one of unique size and shape. It also offers high viewpoint that can be reached by car. 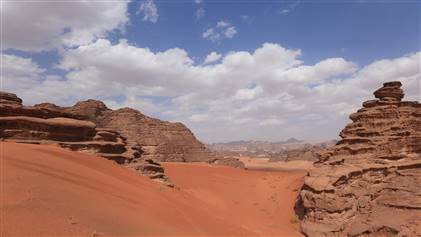 It Is The Extension Of Wadi Rum South Of Jordan and is Considered one of the top locations for mountaineering lovers. It is a wonderful dreamy location where mountains with red sand dunes and many more natural elements. Tabuk region, where you can find the beauty and diversity of its most fascinating places. This is the land of generosity and kindness. Tabuk is the perfect place for traveling into a desert, climbing mountains, fishing, diving into the sea of beauty and surprise, experiencing the history and civilizations of different eras and arts. على بعد حوالي 100 كم شمال غرب تبوك تقع بجدة، حيث موقع خاص محاط بجبال الكثبان الرملية الحمراء والعديد من العناصر الطبيعية الأخرى، والتي تتميز بتلالها الجميلة والرمال المتعددة الألوان، وتنتشر الآلاف من التكوينات الصخرية على مدى مئات الكيلومترات، حيث تتميز كل واحدة منها بحجم وشكل فريدين. كما تتوفر نقاط مشاهدة عالية يمكن الوصول إليها بالسيارة. وتعد بجدة امتدادًا لوادي رم جنوب الأردن، الذي يعتبر واحدا من أفضل المواقع لعشاق رياضة تسلق الجبال. . . أقرب مطار: مطار الأمير سلطان بن عبد العزيز، الذي يبعد حوالي 120 كم.